The threat of being cut off from Spain is prompting companies in Catalonia to move their head offices to other parts of the country. 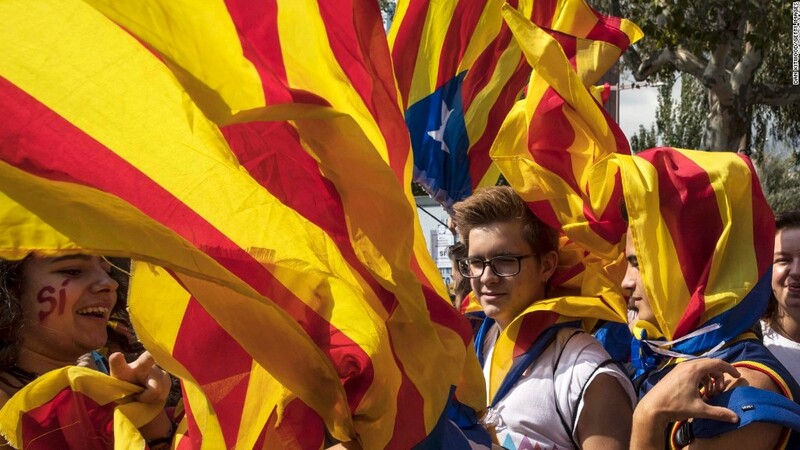 Separatist leaders in the wealthy region have threatened to declare independence from Spain -- the fourth biggest economy in the eurozone -- setting off a severe political crisis that has unsettled businesses and investors. Catalan President Carles Puigdemont is due to address the regional parliament later Tuesday. He's under growing pressure to stop short of declaring a unilateral split from Spain. Some 90% of Catalans who voted in a disputed referendum on Oct.1 backed independence. But the turnout was 43%, and many other residents want the region to remain a part of Spain. Some executives aren't waiting to see what happens next, and have protectively moved their headquarters out of Catalonia. 1) CaixaBank: Spain's third largest lender by market value, CaixaBank, said Friday it would move its registered office from Barcelona to Valencia. It said its priority was to protect "clients, shareholders and employees" given the current political and social situation. 2) Banco Sabadell: The 135-year-old bank announced late Thursday that its board had decided to shift its legal home to Alicante in southeastern Spain. It said the relocation wouldn't involve the transfer of any employees. Banks would be particularly hard hit by a split with Spain as Catalonia would likely find itself outside the European Union and its system of regulation and safeguards. In that case, they would also lose the right to do business across the EU. 3) Abertis: The board of the global toll road operator has decided to relocate its registered office to Madrid. 4) Cellnex: The company, which builds and operates wireless telecommunications infrastructure across Europe, has confirmed plans to move its headquarters to Madrid. 5) Colonial: The real estate company with holdings in Spain and France confirmed Monday that it will move its registered office to Madrid. 6) Gas Natural Fenosa: The energy supplier said Friday that legal uncertainty stemming from recent events had prompted its move to the national capital Madrid, which was aimed at protecting the "interests of the company, its customers, employees, creditors and shareholders." 7) Dogi International Fabrics: The textile maker said on Friday that it would also move to Madrid. 8) Oryzon Genomics: The biotech firm said last week that it was moving from Barcelona to Madrid to "optimize its operational effectiveness and the relationship with its investors." The trickle of companies on the move could turn into a flood if uncertainty increases further. Spain's national government made it easier for firms to relocate on Friday, passing a law that removes some of the red tape required to shift a company's legal home.